This week I finally added another character. I decided to use my BfA boost and I made a level 110 mage. The reason I chose mage is to get access to portals. I’ve picked up Blacksmithing and Tailoring, but I have not got any meaningful recipes yet. 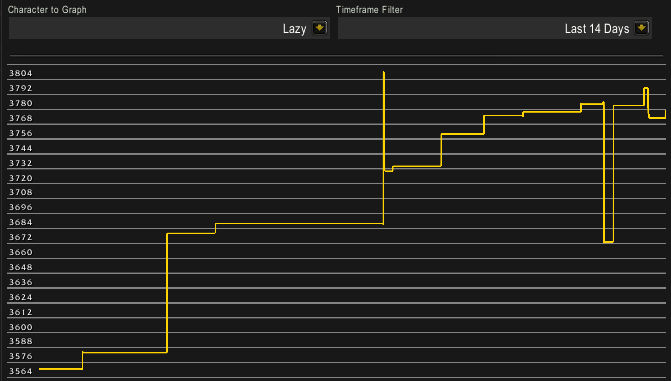 This will also potentially give me a third order hall although I doubt it will matter. I’ve also played my Nightborne priest a bit. Hopefully I will have time to level it to 110 by the time BfA rolls around as I am planning to run it as my main. This week I restocked a ton of stuff. I restocked a lot of food and enchants for the first time in a long while. I also started stocking the Mists of Pandaria crafted PvP gear on my leatherworker. The food has started selling really nicely and it’s really a shame I’ve been out of the market so long. In terms of statistics this week was not particularily noteworthy. 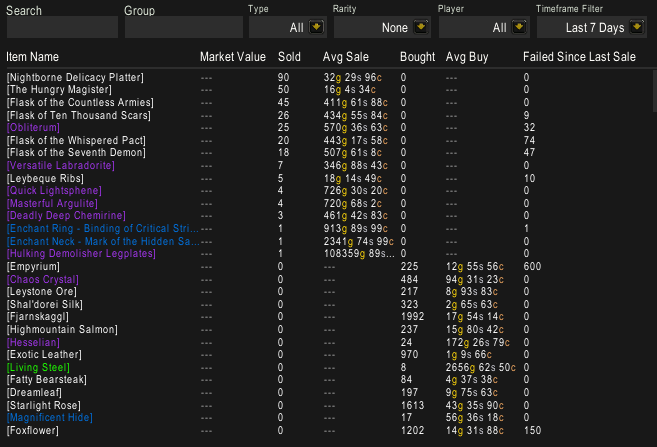 I only managed 190k in sales, primarily because the BoE market is not going to well. 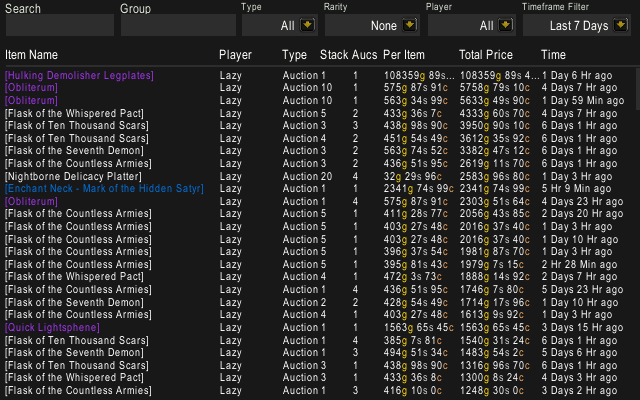 Note sure if I want to quit it completely, but I have started selling my 101s alot cheaper. 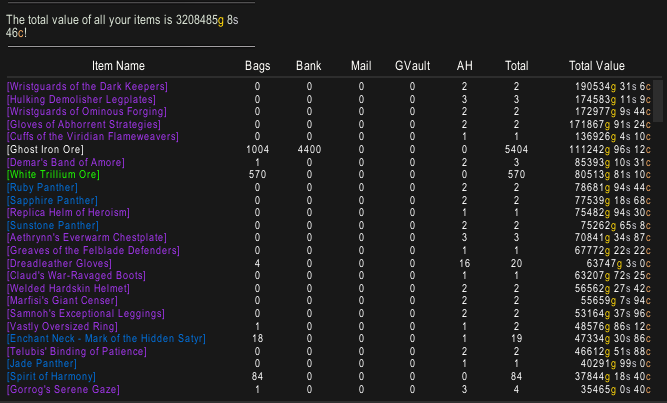 Yet again I only managed one BoE sale. At least it was a decent one at 100k. Outside of that my volume has primarily been in flasks this week. I’ve also moved a decent amount of Obliterum which is very nice. You should definitely check into if it’s profitable to obliterate epic gems on your realm. It certainly is on this one. It looks like it can be very profitable to buy uncut gems on my realm and cut them straight up, so I am looking into stepping up my gem operation. I am essentially out of Quick Lightsphenes and Masterful Argulite, so that would be a nice addition. We can see that the newly crafted food is already bringing in a nice volume alongside my flask business. Next week I expect to see a nice increase in enchanting sales and gem sales as well. You can see a smattering of what I spent money on in the buy column. I restocked some panthers this week as you can see. Outside of that my stockpile is pretty much unchanged. I am still sitting on a large stockpile of BoEs that I am hoping to sell. I will likely have to increase my efforts quite quickly to unload them. Nice! What char do you think is the best to use boost on for BoA (excluding warrior, warlock, shaman and priest)? What professions do you also think will be the main ones for moneymaking?